Can't help but always go back to my boho roots. With lace trims and a wispy form to adapt to any summer breeze, this is the dress of Californian dreams. Who knew that a dress like this would be waiting for me at Crossroads Trading? Also just wanted to note it's definitely possible to construct a decent outfit from thrifted finds. Trying to soak up all the sun I can get since I'll be leaving for New York Fashion Week next week. Beautiful pictures, you look great! Gorgeous!! I love your dress so much! cute crown and adorable lip color! really nice pics and vest! sorry, no vest... nice dress! Lovely boots, I can totally understand why you keep going back to them! Okay, I'm seriously just dying over this dress right now. It's gorgeous and definitely screams California! Great shots too. Your photographs are beautiful! really love ur style, u nail it girl ! That dress is absolutely gorgeous! The flower crown tops it off perfectly. This is such a beautiful boho chic outfit. The dress is awesome. Thanks for posting the photos and feel free to drop by me too anytime. That white dress is adorable, great that it matches the setting, thumbs up! 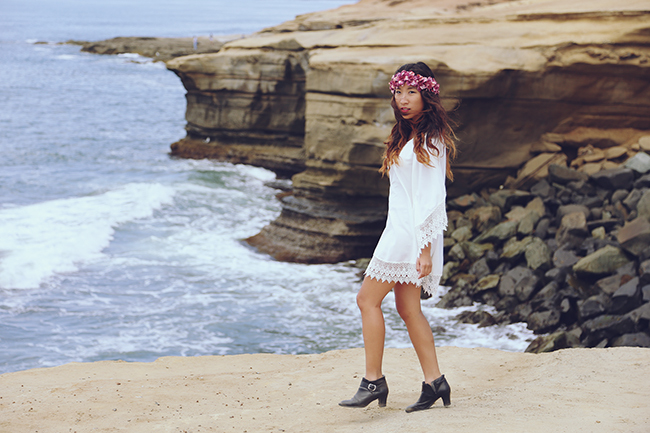 Bohemian chic for sure ;) LOVE the flower head piece on u! Love the boho chic look, the head crown is so pretty! Do visit my blog and if you like follow on GFC,Bloglovin,Instagram, twitter,Lookbook and facebook, leave a comment and I'll follow back too! Oh wow, gorgeous! I love the beach background - sigh. Makes me long for walks in the sand. 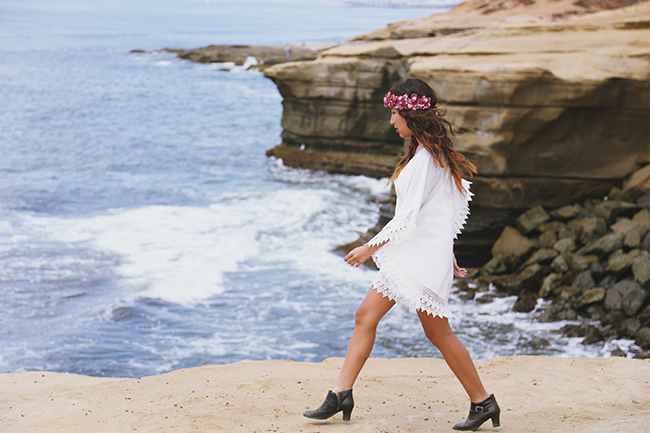 I love your festival-style with the floral crown, cool LWD, and tough boots! You are so pretty and you've inspired me when first I saw this :D Following you now, check out my blog if you have time! amazing! everything on this post! i'm following you now! would love if you followed me back honey! You look gorgeous. I love the floral crown! Beautiful dress, and you gorgeous. That dress is fantastic, perfect for hanging by the seaside! Perfect choice for going to the beach. I love that dress! I also love how you styled everything. The pics look stunning and so do you. I adore your dress, and such a stunning location to shoot photos in! I love that white dress. I've been looking for a similar dress for the fall (I know it odd lol) ! The pictures are so beautifuly taken! 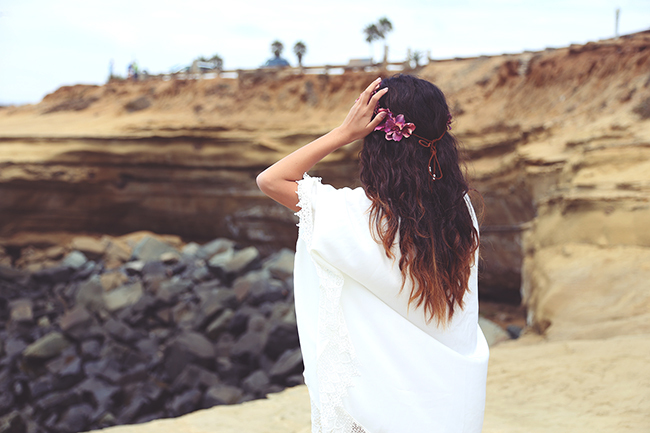 This outfit is perfect, love the flowers crown. love that pretty dress (hehe I just want to crossroads yesterday) and so is the floral crown. These photos are so pretty too! Wauw, love the white outfit on the beach! aw, the beach is so beautiful, the outfit and you perfectly suit there <3 i'm in loveee !!! soooooo dreamy! I adore your head piece!